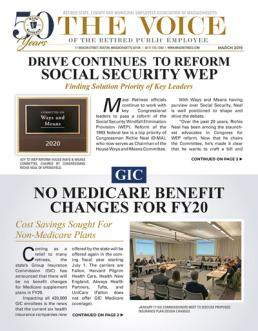 FEBRUARY 2019: Mass Retirees officials continue to work with key Congressional leaders to pass a reform of the Social Security Windfall Elimination Provision (WEP). Reform of the 1983 federal law is a top priority of Congressman Richie Neal (D-MA), who now serves as Chairman of the House Ways and Means Committee. With Ways and Means having purview over Social Security, Neal is well positioned to shape and drive the debate. Duhamel joined Association President Frank Valeri on Capitol Hill in late January for the first round of serious discussions on WEP reform to take place since Democrats gained control of the House earlier in the month. “There is a strong commitment amongst elected officials, Congressional staff and the members of our national coalition to finally get a deal done. That said, we still have a lot of work to do. Just the physical logistics of the change of power in the House takes time to implement. We met with staff who are still unpacking moving boxes. I’m confident that we’ll see the details of a new WEP reform bill come together over the coming weeks,” said Valeri. While legislation has been filed again this session to fully repeal the WEP and Government Pension Offset (GPO), Association officials do not believe the proposal has a realistic chance of passage. “For 36 years efforts to fully repeal WEP and GPO have proved fruitless. We do not have the votes or support to pass such a bill. This is why, in 2014, we shifted our position to develop a realistic proposal to reform the laws. More and more retirees are harmed by these awful laws every day. Compromise is needed if we’re ever going to deliver relief,” explained Duhamel. Starting in 2014, Neal and Brady have been working together with our national coalition to pass a reform of the WEP law. The two Congressmen and their respective staffs have since crafted a series of proposals specific to WEP reform. In 2016 legislation, nearly made its way to the House floor for a vote before being held in Committee due to concern over the lack of a transition period for changes relative to future retirees. “We remain committed to reform of Social Security and will not falsely lead our members to believe that a full repeal is possible. The fact is that we do not and will not have the votes to pass a full repeal. Reform legislation is the best chance at putting money in retirees pockets,” added Valeri. 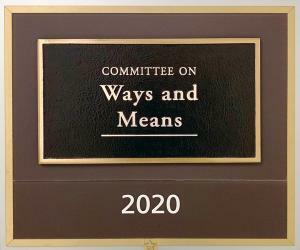 With Neal Committee Chairman and Congressman John Larson (D-CT) serving as Chairman of the Social Security Subcommittee, the specifics of a new proposal are now a work in progress. Larson, a former Connecticut high school history teacher and football coach, represents the state’s 1st Congressional District, which includes the City of Hartford. Connecticut teachers, like their Massachusetts counterparts, do not participate in Social Security and are therefore affected by the WEP and GPO laws. The previous proposals centered on two aspects of reform. The first would be to provide a rebate or Social Security benefit adjustment for those impacted by the WEP prior to 1/1/2025. This would provide a cash increase to retirees’ monthly Social Security checks. Future retirees (those eligible to Social Security after the new law’s effective date) would retire under a brand-new Social Security formula that would proportionally calculate Social Security benefits based on covered service. Covered service refers to employment covered by Social Security vs. non-covered service from employment outside of Social Security, such as public sector work in Massachusetts. Association officials have also recently met with the AARP at their Washington, DC headquarters. AARP remains in support of our efforts to reform the WEP, as they believe the current formula is unfair. The nation’s largest advocacy group for seniors has been a key ally in advocating for WEP reform in recent years. For retirees impacted by the GPO, the outlook remains rather opaque. While Association leaders do not anticipate Congress taking up a wide-ranging GPO reform, there is a chance of modest steps at lessening the law’s impact. Association and coalition officials continue to request an end to ongoing COLA offsets, as well as a pitch to provide enough of a Social Security benefit to pay the basic cost for Medicare Part B. More will be known in the coming months as to what shape the proposal may take.